The stabbing of Paweł Adamowicz is a tragic incident and one that is very symptomatic of the current Polish reality. But for reasons different than you might think. Certainly the mayor of Gdansk is not a random person and his death had to provoke a major disturbance in the public sphere. The collective reaction however is fairly disappointing. Considering how willingly this tragic incident is blamed on the supposed ‘bleakness and brutality’ of Polish political life one would expect if not a movement, then at least a display of desire for some kind of major change. What is happening, however, is exactly the contrary. Since the incident, the media, the ‘experts’, the social media celebrities, and the political establishment with its hordes of fanatics have been doing everything they can to strengthen the paranoid atmosphere that obviously contributed to the murder of Adamowicz and will surely bring more destruction in the future. The stabbing happened on January 13th right before the final concert of a major charity festival, whose organizer is a vulgar right winger and a staunch opponent of the current Polish government. Shortly before the closing event Adamowicz gets on stage to congratulate the organizers and thank the public. He is then approached by the 27-year-old Stefan Wilmont who stabs him several times in the chest and shouts that he was “tortured in the prisons of Civic Platform”, which is the party of the opposition. Hence his actions. The assailant is apprehended and the investigation begins immediately. So far we only know that the prosecution has come up with a charge of “murder for reasons deserving special condemnation” and that the courts have agreed to a pre-trial detention. Shortly after the incident the topic explodes in the social media. The attacker’s identity is quicky determined as well as a lot of information regarding his criminal past record, his time behind bars and the fact that he has has been under psychiatric supervision since childhood, which in a healthy environment would lead the general public to quite obvious conclusions. In Poland however this does not happen. The politicians, the media and the so-called opinion makers almost never allow reality to influence them. Therefore the moment of reflection that could potentially have resulted in moral and – had there been any basis for this – political considerations never really occurred. What happened instead was yet another outbreak of the massive hysteria that the Poles have so smoothly and quickly adopted, allowing it to almost completely replace politics in recent years. The drums and fanfares of – as it is often referred to here – the ‘Polish-Polish war’ were again on full volume and within hours of the stabbing it was clear that everything would be business as usual. And it is. This natural public grief was immediately translated into the usual aggressive encroachment between the two main political players in Poland – the ruling Law & Justice (PiS) party and Civic Platform (PO) in the opposition. Both very similar to each other; the first likes the Catholic Church more than the latter and understands the importance of populism in politics. Otherwise, PO is pretty much like the Democrats in the US – they offer exactly nothing except for the return to the status quo that the majority of the Polish population rejected in 2015 by handing power over to PiS, which ran on a fake antisystemic position. So the two camps and their fanatics commenced their ceremonial shout-out, blaming each other for what happened and pumping the hysteria to psychiatric levels. 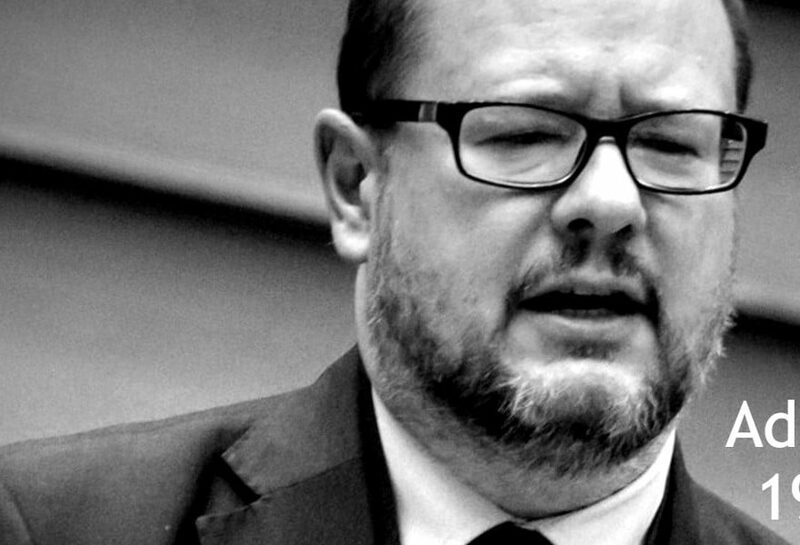 For ‘civic society’ Adamowicz immediately became a martyr and a victim of ‘Kaczyński’s dictatorship’; and for the others it was all a result of the ongoing ‘campaign of contempt against PiS’ and ‘regular people’. In such a paranoid atmosphere, in which masses of people are effectively subordinated by aggressively hyped common nonsense and are submerged in the swamp of the hue and cry conveniently evading any facts, nobody is allowed to ask any questions. No media, no commentator and no politician would have allowed themselves to say the obvious. Namely, that the murder of Paweł Adamowicz by a mentally unstable, aggressive male with a criminal history is symptomatic of the atmosphere in Poland, but at the same time it has nothing to do with politics, contrary to what the local ‘experts’ on both sides of the barricade claim. The fact that the public sphere is full of hate, revanchism, intolerance, frustration, despair and violence does not necessarily make things political. Politics is about collective interests and the clash of ideas. There is no such thing in Poland. The foundations of the unprecedented social polarization there are exclusively sentimental. And the “political” emotions in Poland oscillate around notions utterly detached from reality; either complete phantasmagorias or peculiar cultural (sometimes historical) issues, mainly juggling symbols, identities and rituals. What is perfidiously called ‘political debate’ in Poland is in fact nothing but an incessant pub brawl, mostly involving emblems (patriot vs. democrat), symbols (the EU banner vs. the flag of Poland), archetypes (Polish vs. Western/Eastern) and rituals (marriage vs. abortion, domestic violence vs. gay parade). By framing any discussion this way the public is led to determine the identity of ‘debaters’ and their belonging to one of only two possible camps: ‘patriots’ and ‘democrats’. Thus, instead of any meaningful discussion we get a bombastic festival of empty posturing, gaslighting and most of all full-scale theatricalization of artificial conflicts between the two camps which are in fact two sides of the same coin. Before you jump to conclusions about how politically unbalanced the Polish people are, ask yourself this: Are these pathological circumstances not quite legitimate? What do you expect of a nation locked in a trap between two on-steroids-right-wing factions? And most of all how could the atmosphere be healthy in a country where the political process is driven by people who sincerely believe that in 2010 some Russians killed their president, or that they are not sleeping well at night because they hear the horrible screams of the fetuses that are being aborted or embryos being frozen for in vitro procedures? What else can be expected of such “statesmen” besides putting society into a collective trance and emotionally torturing it? This emotional exploitation of the people in an alternativeless political landscape will surely bring more destruction; the moral, political and cultural downgrade is getting more intense and brutal every day. The ‘experts’ in Poland and internationally will tell you fairytales and myths about how Polish political life is filled with contempt and hatred and how it leads ordinary citizens to stab politicians instead of drinking their evening vodka in front of the TV. This is not true. In Polish politics – as long as there is still such a thing, we see some aggressive play with symbols, but no violence other than exactly that – symbolic. And there is no way a recurring set of cheap manipulations and games would lead to killings of a political nature. It is the massive sentimental hooliganism orchestrated by the elites. Fewer and fewer people are able to endure it. The murder in Gdansk was a criminal act and not a political one. It just contained some elements of the PiS vs. PO extravaganza i.e. the shouting about “Civic Platform’s prisons” where the attacker was supposedly “tortured” (completely possible BTW). On an endnote: Paweł Adamowicz is dead. As mayor of the city of Gdansk he was a notorious neoliberal who pushed brutal policies against tenants and then made his officials run smear campaigns on social platforms against local movements which opposed them. He was also heavily involved in a big financial scam and corruption scandal by the name of Amber Gold, still being investigated by a special parliamentary commission. Because he accepted some refugees in Gdansk he was lifted to the rank of hero among the ‘civic society’ and the ‘democratic forces’ for which nothing else matters other than the most current hysterical topic. Another right-wing bureaucrat whose tragic death has given him the aura of holiness, although as a politician he only deserves contempt and oblivion. Whoever has seen the fear and pain of people evicted from their houses, whoever has felt the devastation of broken families losing all they had, whoever has stood helplessly looking at the violence perpetrated by the state against the unarmed and poor in the majesty of law … they will understand. Previous Post:Who gets isolated by the anti-Iranian sanctions – Tehran or Trump?